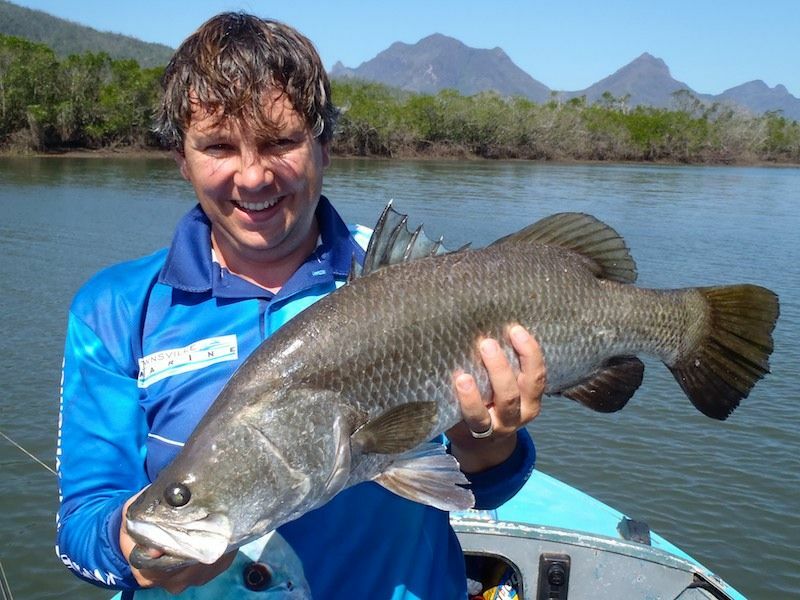 Last weekend the tides and weather really seemed to point toward a top fishing weekend chasing Barramundi at Hinchinbrook. Tides were of a reasonable size without being too big, the winds were light and top of the tide was early morning allowing a full days fishing the preferred run out. Saturday was our planned day, but things didn't work out and we had to fall back to Sunday. Dad picked me and the little boat up about 5am to drive the one and half our trip to Fishers Creek. Its a long drive, but would be worth it if we nailed a couple of good fish. We launched close to 6.30am and immediately headed off for the Benjamin Flats area. 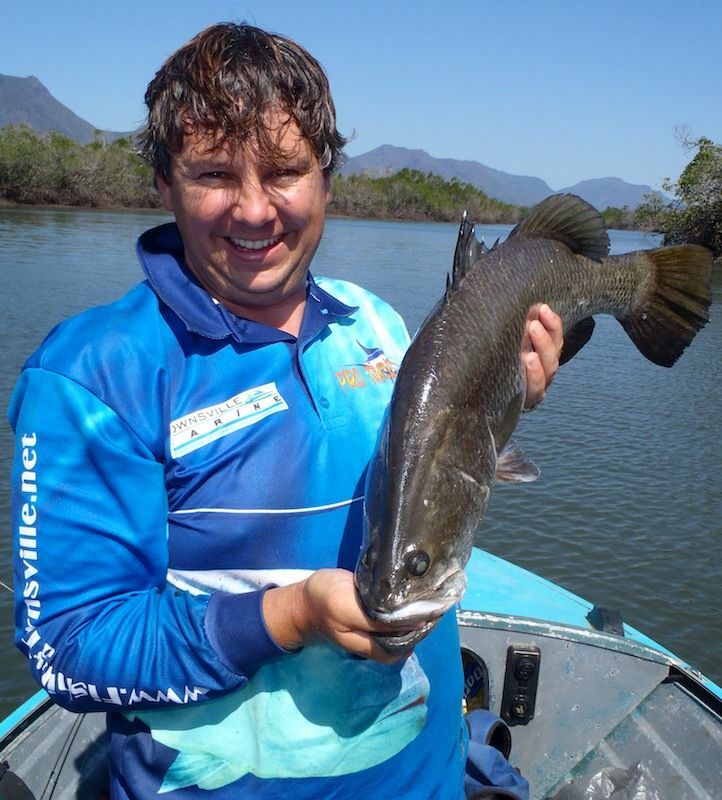 We really don't know Hinchinbrook too well, having only fished it for Barra a couple of times. We snuck into a likely looking creek that had a lot of fallen mangroves from the Cyclone last year. The water was very clear and there was bait all through the system! This creek produced a couple of flashes and missed hookups from the Barra, mostly on white prongs. But it wasn't until we got closer to the top of the cree that I hooked up the first fish if the day. 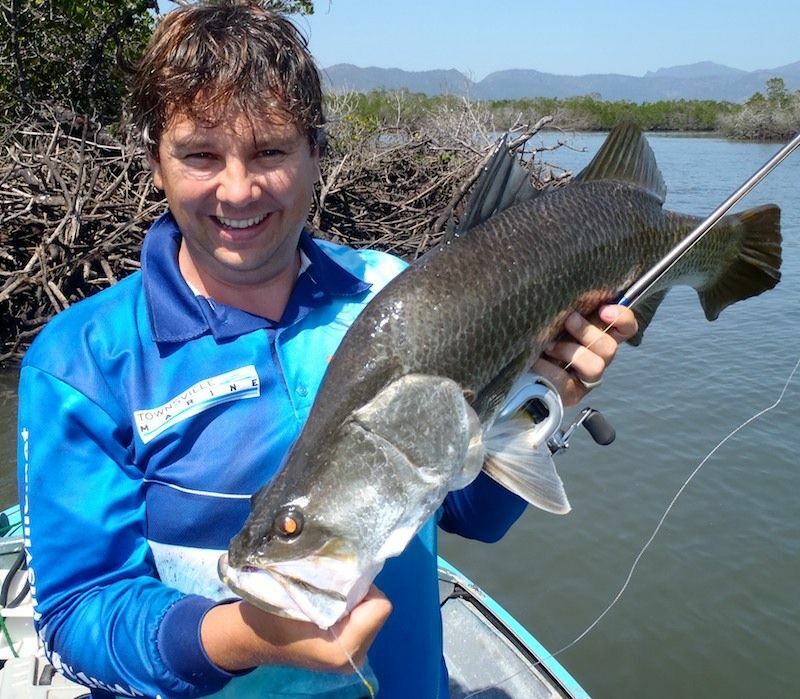 It was a good solid Barra, probably well into the 70cm range. 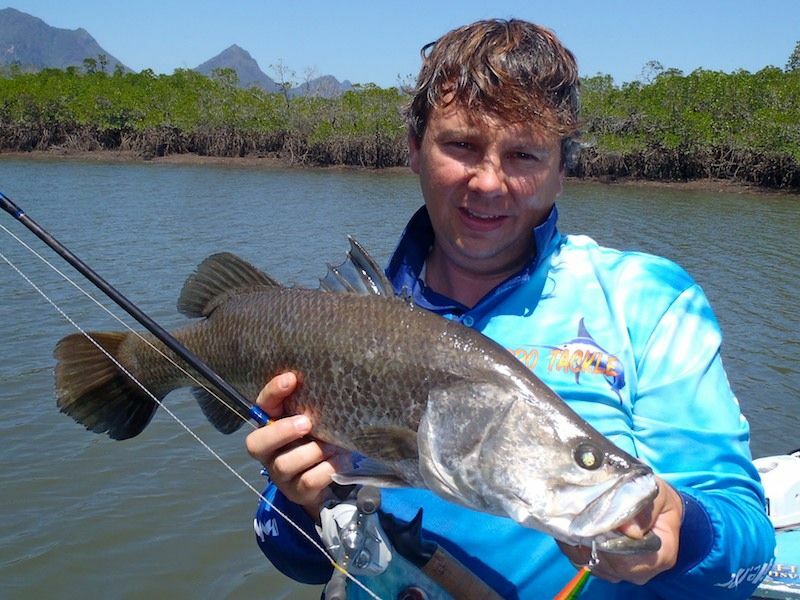 It followed my 3in prong out from the mangroves and stopped just 2m shy of the boat looking at the lure. I immediately paused and allowed the lure to sit. 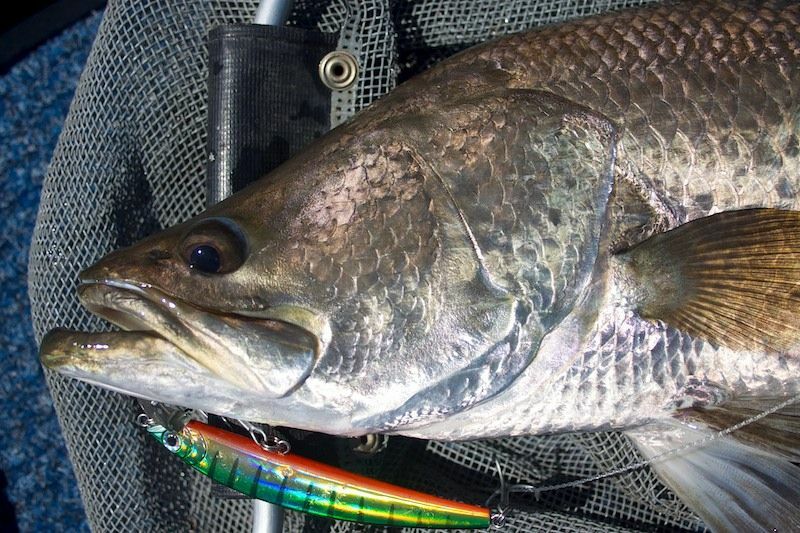 It's very hard to refrain from twitching the lure to entice the fish to strike, but more often than not this will result in the fish spooking and vanishing back to his haunt. The lure slowly sunk out of site the Barra followed it down. A little wait on the rod and lent back to set the hooks. The water exploded as the fish jumped clear of the water. At this stage I was only fishing 8lb on my Stella 1000. But the fish was in open water and I thought I had a pretty good chance of landing this fish. The Barra had other ideas! He soon turned and headed for the sticks. I applied extra pressure to stop her, but there was nothing more I could do. Once in the timber it didn't take long of the line to pop. Being the first fish of the day, and never being sure of another, one that loss really hurt! We looked in another couple of creeks close by but didn't like what we saw. There were just too many mangroves and no real stand out structure. We saw a few Barracuda and small GT, but no Barramundi. We then headed further up the flats in search of some of the famous Hinchinbrook drains. The tide was running out well at this stage and we figured the drains would be the place to be. The next bit of structure we fished was a large clump of dead timber lying in the corner junction where to creeks came together. We were immediately greeted by a large fish swimming clear in open water just wide of the snags. I was working my lure toward the fish when a second Barra suddenly appeared. Dad had his lure right in front of this fish, and when it moved toward the prong the first fish turned away from my lure and went to look too! This seemed like a given, two fish looking to fight over Dads 4in prong. But it wasn't to be. Dad paused and let the prong sit and both fish seemed to go down after it just like my first, but they just disappeared. After loosing my first fish on 8lb, I had now changed to my Chronarch and 30! I stuck to the trusty Flatz Rat and put it hard back into the timber where these fish had come from. Only a small twitch an BANG, the water exploded. 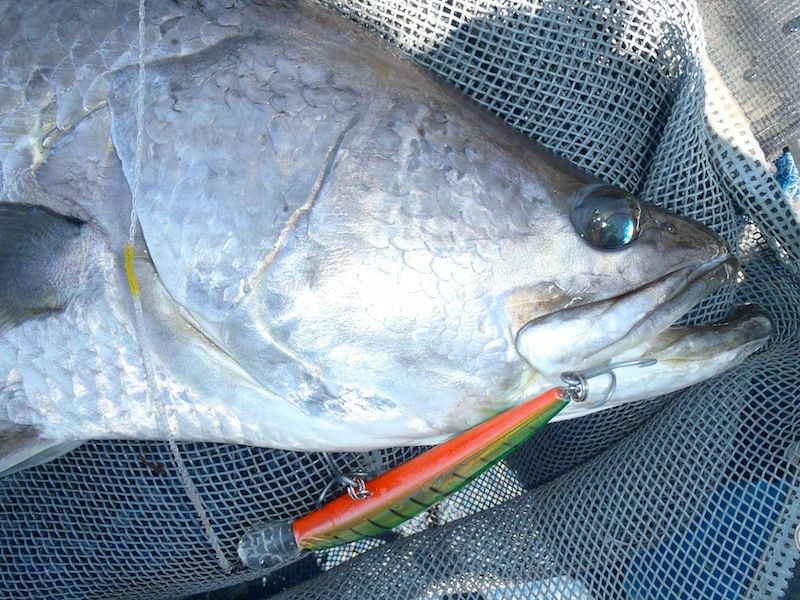 A good soling fish (guessing close to 80cm at this stage) erupted from the water, mouth open and trying to shake the lure free. It was a good fight and the fish made several attempts to get back into the timber. 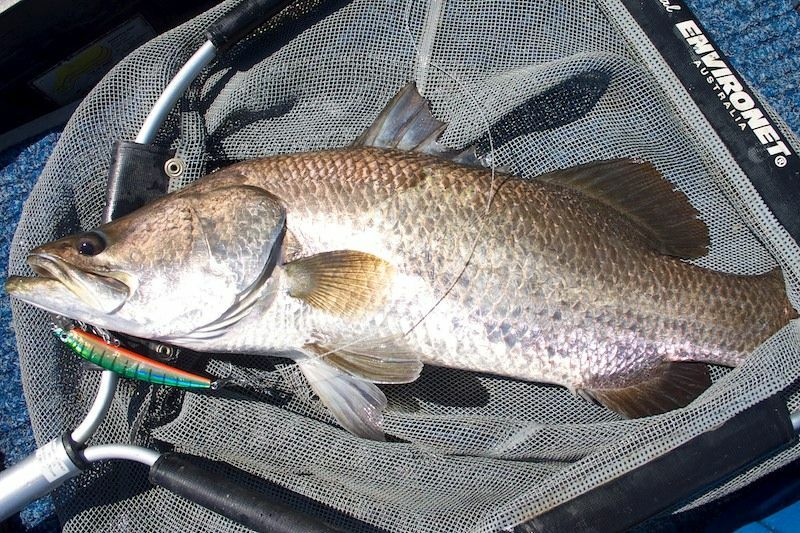 But despite being able to freely pull drag against the 30lb Power Pro, it was much easier to handle than my first fish. It was soon netted and handshakes were had! On the tape it went 75cm, but she did look big in the water! Knowing we had found where fish were hanging we worked this area pretty extensively, but couldn't raise another fish. Time to try another creek. We were going to head back inside the flats and fish some creeks closer to Conn creek. But a last minute decision and very flat Channel saw us head across to Hinchinbrook Island. There are many good creeks that line the island side, so we decided to take a look at a few. This proved to be a good option, and as the tide bottomed out and started to run back in we came across a couple of good patches of fish. Some came from drains, one from out in the open, but most from prominent snags that had good water around them at the low tide. 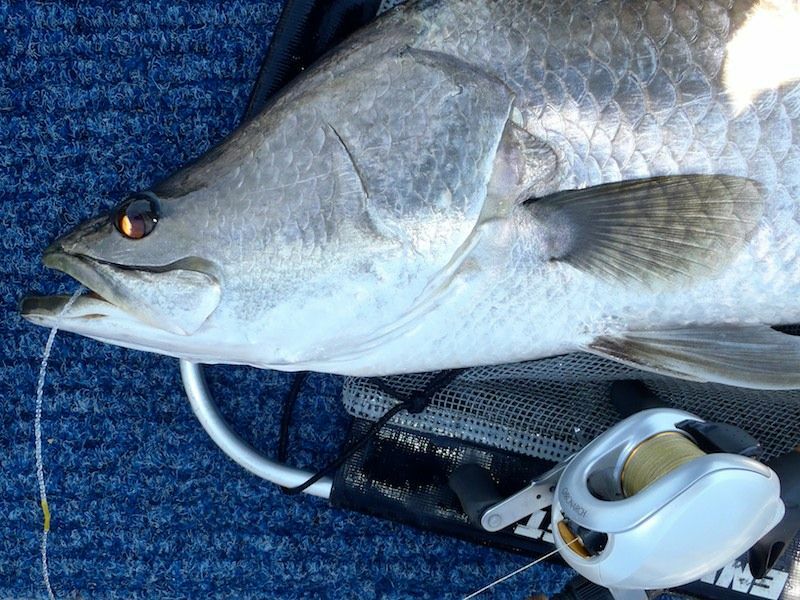 As the water was shallower on the bottom of the tide I had changes to a shallow running suspending Yo-Zuri lure. In all we boated another 5 fish ranging from 61cm to 74cm. Plus the usually missed strikes, jump offs and rat fish. About 4pm we headed back to fishers and the long drive home. I learnt a lot from this trip. 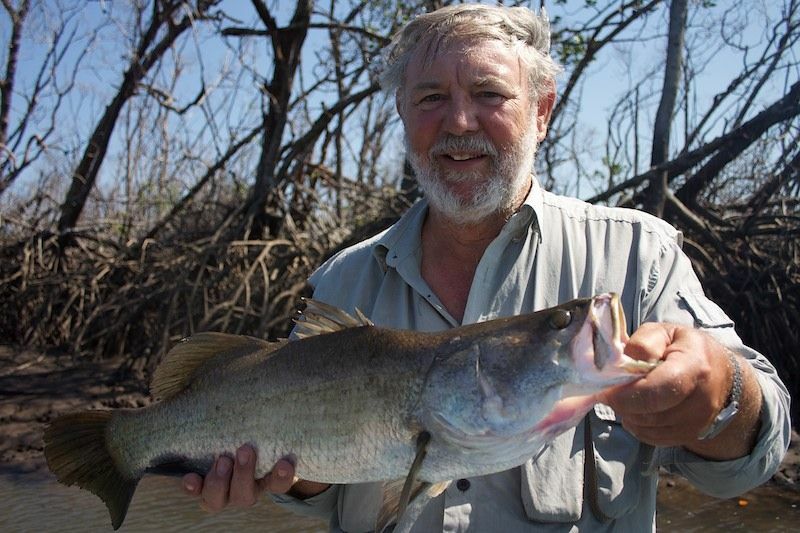 To fish an area you know nothing about and to find good fish was very rewarding. My biggest lesson was to not spend too long in a place that just isn't fishing well. Move on and find the fish. I got to try a couple of lures and techniques I don't usually use, and give the success I will be trying them more in the future. I also had the opportunity to put Phil Lawlor's new 'twisties' leaders to the test. Phil has been making the All Aussie Shock Leader now for quite a while, but this new twisted design is brilliant addition to his range. I'll write more about this one in the near future, but if you look closely at a couple of the picture you will get the idea.